In the past, the steep stairwell has hindered access to this area. Of the 15,000 visitors to the Museum and Art gallery in 2015, over one third were seniors and many more visiting groups with mobility issues were unable to see the exhibitions. We were delighted to be able to install a lift in this area. A Royalties for Regions grant Wheatbelt Community Chest Grant supplied $49,950 of the funds, the Benedictine Community supplied an equal amount and $6000 was donated through the Friends of New Norcia Special projects scheme. Since the installation the lift has been of great benefit and use within the gallery. The New Norcia Ecclesiastical Textile collection, begun by Rosendo Salvado in the 19th century, continues to evolve and strengthen into the future. The earliest and most significant part of the collection of almost 1200 pieces – the so-called Spanish Collection of 30 items - is about to be moved into its new home in a dedicated room in the old St Joseph’s convent at New Norcia. (7) As this long project comes to fruition, it is with appreciation to the commitment of the Benedictine community, through the support of the National Library of Australia’s Community Heritage Grants section and due to the generous donations from many of the Friends of New Norcia that progress is being realised. A ‘Special Project’ fundraising focus was established by New Norcia in 2014; its aim was to renovate the first floor of the former Benedictine Sisters’ convent as an Ecclesiastical Textile Storage area. Almost $29,000 has been raised to date through the Friends. Following on from the recommendations of the Preservation Needs Assessment Report of 2012, Monochorum proceeded with the establishment of the new, enlarged and environmentally appropriate storage facility in the area identified by the PNA as the most suitable, which were the rooms on the second floor of the Old Convent. Upgrading works undertaken and completed in 2015 saw the renovation of three sizeable rooms, two passageways and a large open space with toilet facilities attached. It included upgrading the electricity, plumbing, painting, floor sanding and finishing, with new lighting and blinds. Work was carried out under the direction of the site architect by external contractors and New Norcia’s in-house maintenance team. While the total cost of capital works, excluding the value of in-house labour, was $35,275, the shortfall has been met by New Norcia’s own resources. As a further contribution to the establishment of the new storage facility, New Norcia has allocated $5,000 in 2016 for the purchase of new storage racking for the other two rooms of the renovated suite, which will house the bulk of the collection. These items are of lesser significance than the Spanish Collection and much of it can be accommodated on a hanging system and shelves. A fourth room has also been cleaned and painted in the same area as an interim workroom with sewing, ironing and storage equipment, acid free materials and padding for the movement and re-hanging of the garments. In the most recent and exciting advance, New Norcia Collections department has just acquitted a grant of $12,727, received last year in the National Library of Australia’s Community Heritage Grant round. With this grant and in consultation with textile conservator Rinske Car and metallurgist Dr Ian MacLeod, a group of custom-designed storage furniture was designed and commissioned from WA exhibition touring company Art-on-the-Move. (1-6) The 4 furniture pieces – mobile drawers and shelving that double as a work bench space –are constructed of hoop pine on castors and will house the most significant and rare examples of the collection - the group of embroidered ecclesiastical garments and altar linen used by the Spanish court, some dating from 1640. Concurrent with these works, the conservators Rinske Car and Dr Ian MacLeod have utilised grants from Healthway and the Copland Foundation, generated in 2013 to celebrate Rosendo Salvado’s Bicentenary in 2014, to conservefour textiles of the highest priority. They are a cope, a chasuble, a mitre and a chalice cloth. 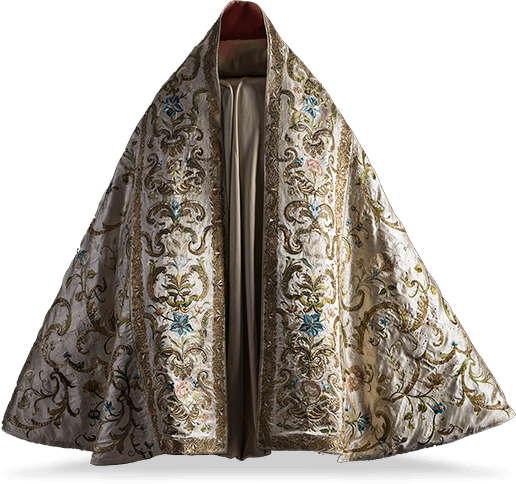 (8,9) The ground breaking techniques developed by Rinske and Ian in stabilising threadbare silk, conserving organic dyes, and treating tarnished gold and silver embroidery, have resulted in these textiles re-emerging as the most sumptuous and exquisite examples of their type. We can now rotate the display of at least one of these conserved items at all times in the Museum & Art Gallery of New Norcia. The research generated during the conservation process has resulted in a number of published papers, delivered at national and international forums by Rinske and Ian. (12) Examples from the New Norcia collection have served both as guides to best-practice and as a stimulus to study. John Viska undertook an Analysis of Plants identified on the conserved chalice veil, clarifying the common and botanical names with descriptions and origins. (10, 11) In 2016 we have been approached by a PhD student from the University of Canberra whose thesis undertakes a survey study of the Ecclesiastical Textiles of Australia. We hope the new storage area will allow further opportunities to access, investigate and celebrate the unique aspects of the New Norcia Textile collection. Dr Ian MacLeod has recently introduced us to a breakthrough in nanotechnology - a copper fibre impregnated plastic material being made into storage (Intercept) bags. (13) With many of the major galleries, companies and museums adopting them, we are trialling their use in the transfer of textile collection items with significant metal components, such as silver and gold thread, buttons and lace, especially as a way to maintain the high level of conservation funded. The copper attracts impurities and effectively cleans while it stores, a win-win also for the durability of funding outcomes and the enjoyment of future viewers. The next phase sees the planning and progressive transfer of the textiles to their new areas, from the present confines of the old Vestments Room. Skilled volunteers are already gathering to assist in this major focus of 2017. There are also other rare and fragile pieces still to conserve, (14) the next priorities on a large list beginning perhaps with the Processional Banner depicting the Madonna, and carried by Salvado and his fellow monks from Barcelona as they set sail for the new world in 1849. More treasures await, more stories to be revived with the fate of the textiles collection, so close to the heart of New Norcia’s cultural life, in the past, present and future. Thank you to everyone who has supported this important and ongoing venture. From 2011 to 2014 the New Norcia restoration project was the Spanish Chapel located within the monastery walls. Built in 1900 as a chapel for the monks it is a fine example of the work of woodcarver, Juan Casellas, painter Fr Lesmes Lopez and Br Salvador Alberich who was responsible for all the gold leaf that adorns the Chapel. Over the decades deterioration has occurred, partially due to wear and tear but also due to deliberate redecoration, for example wallpapering over a hand-painted curtain mural that used to frame the original altar. New Norcia partnered up with the National Trust to enable this project to become tax deductible. The scope of works finished included electrical rewiring, replacements of the lights, repairs to severely cracked walls, restoration and replacement of floor timbers, removal of wallpaper and repainting of the curtain mural on the sanctuary walls, the repainting and reglazing of doors and windows, replacement of louvres with casement windows, manufacture of new sashes for the windows as wells as replacement of three doors which were previously converted into windows. In 2014, Van Diddens Australia, the contractors responsible for the painting and restoration work on the Spanish Chapel, were the winners of the Master Painters and Decorator Annual awards - Historical Restoration. The judges commented that this was an impressive project, with a great deal of restoration work done to an excellent finish. 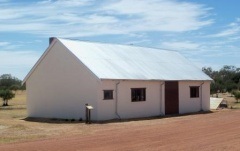 The restoration of the Blacksmith’s Shop was re-opened as a Friends project in 2010. Most of the structural and external work was funded during the 2008 fundraising, however other aspects remained unfunded including the internal fit-out, interpretive resources and lighting and electrical works. The lighting and electrical work has been completed and work is now underway to prepare the interpretative resources. In memory of the late Abbot Placid Spearritt, who died in October 2008, New Norcia founded a scholarship in 2009 with the intention of bringing a scholar to New Norcia each year to work in the Archives on a specific project. The research would then be made available to everyone interested in Australian history. 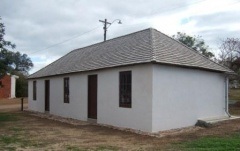 The 2008 Friends Special Project was the restoration of the Blacksmith’s Shop. Work commenced during 2009 and included a new roof and work on the walls, window and door frames and the doors themselves. The 2007 project saw $150,000 collected towards the creation and installation of a state of the art storage system for New Norcia’s art collection. With over 300 artworks in the collection and a regular programme of exhibitions, interdepartmental rehangs and loans to outside institutions there was a need for a safe, secure, user-friendly storage area. 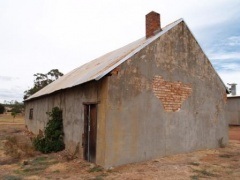 Built in the 1860s for an Aboriginal family, the cottage on the northern side had various uses during its time; accommodation, an occasional police station in the 1940s and by the 1960s a public toilet block. Over the years it had fallen into a significant state of disrepair and restoring it was a challenge, however work was finally completed in 2008 and it is now open for the public to view along with interpretative material.